It was at Kuse, where my Ate Danielle and Kuya Darren (well they are my kids, 13 years old and 15, accordingly) had their fill, during the last day of Food Adventure at the Venice Piazza. My Food Adventure was a three-round venture, the first two Saturdays where extremely satiating for me and my hubby, though it still left us five more restaurants to render. Twelve establishments at the Piazza of McKinley Hill connected for the Food Adventure. Each giving out a sample of what might be the best on their menu. I will announce the Best Restaurant for me in my next posts or better yet I will try to come up with a rating. This would be according to of course the dish served, the taste and the plating, the service, and the place itself. For now, let me tell you of our family food escapade yesterday, July 30. As mentioned we still had five more joints to try. Then my husband thought of bringing our kids along this time, and have them try out the other restos, meaning we had the five restos for sharing. What a clever idea! We only bought two passports, for me and my hubby. Our daughter Danielle, is not a picky eater so we were quite sure she will enjoy her choice of restos. Darren however is starting to enjoy different dishes away from the normal comfort food he'd usually have at home. So this would be a good experience for them. Kuse was the second restaurant they tried, they didn't like the first, so much. While they were having the Baked Cheese Macaroni, I had brewed coffee, as I was observing them how they would be enjoying or not their food samples. While my two other kids were with their Daddy at KFC. They said the baked pasta was dry and needed a little more sauce and cheese. Plus it was cold. The dish have orange salad that went with it. The serving of the greens were more compared to the pasta. Well, they were frustrated, thinking they will get the same look as what they see on the Food Passport. Tsk. Tsk. Tsk! Moving on to the next resto, Kuse. I decided to order from their menu. Let me just tell you one of the restriction of the Food adventure, diners with the Food Passport only eat outside. Why is that I don't know?!! If I'd be to interview some of the participants of the Food Adventure, that is the one's who bought the Food Passport, I'd bet many would attest to that. Judging by the looks of some of the diners, they weren't that happy. It was actually raining continuously that night, it was cold so not that too many people were there. Mostly are diners wanting to finish the Food Adventure. I did not check the mechanics of the "passport", till now, I did not see, anything saying FA diners are not allowed inside the resto, or something like FA diners can only be accommodated outside. My kids and I went inside Kuse, the crew immediately asked us without seating us first, whether we have the Food Adventure. I said, " my two kids will have them, and I will have the Ala Carte," he then continued saying, FA diners are only for outside dining. Without getting infuriated, I just said I will order food from the menu, so why is that any different if I want my kids to eat with me inside the restaurant. So he then said it's okay. HHHMMM!!! I will have my final say after I've announced the Best Restaurant on my concluding blog about Food Adventure. Since Old Vine Grille is next to it, the waiter asked if they could serve Salmon Carpaccio together with Kuse's Adobado. So it was served first, right after their house Iced Tea was served. My kids loved it, knowing they had not tried Sashimi or Kilawin yet, though we would always have Pink Salmon Sashimi at home. I tried it also and it was really good. 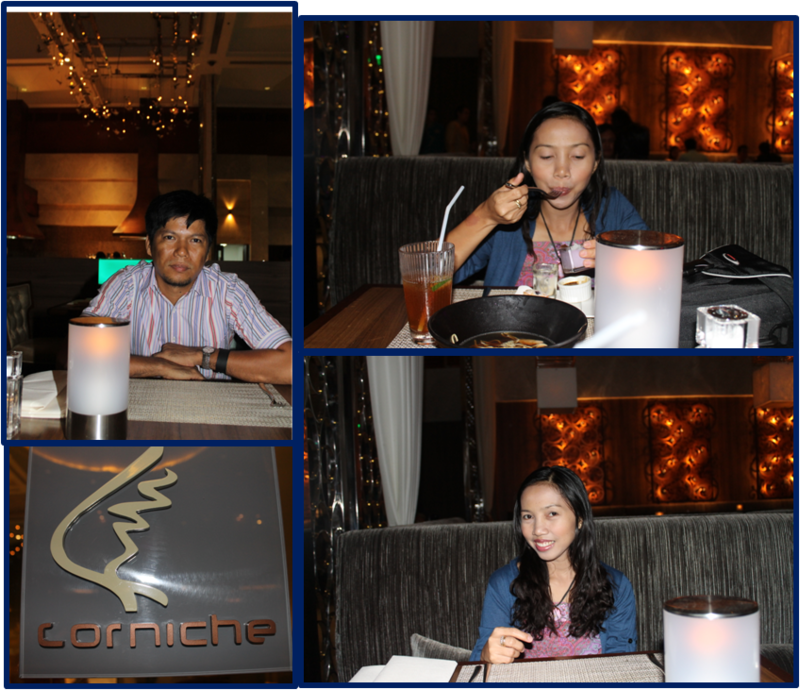 I will definitely go back to Old Vine and try more of this with hubby and some other dish from their menu. Too bad I was not able to check out their menu. Carpaccio as I understand is an appetizer of thinly sliced raw meat and in the case fish. What this dish stand out for is the unique minty flavor infused in the fish, maybe the marinate, if it was marinated or the minced herb served with it. Both of them enjoyed however, Beef Ribs Adobado. 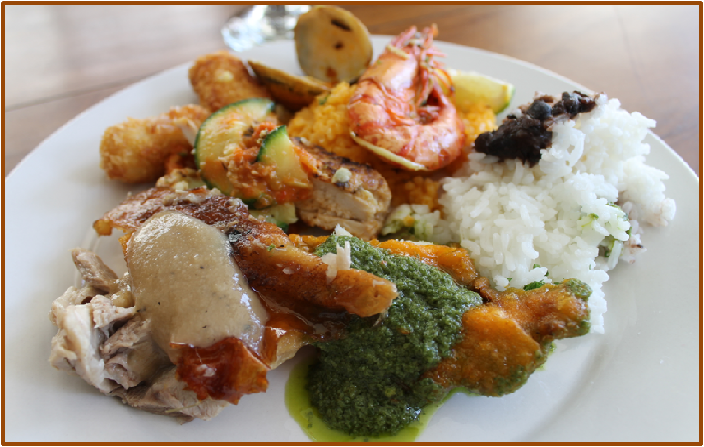 Kuse is an all-Filipino cuisine whilst putting a twist on their every dish. Though they don't concentrate on a certain typified region they boast of indigenous dishes giving a "whapack" to each of them. Like this dish, imagine BBQ Baby Back Ribs, cooked like Adobo. The smokey beef blended so well with the Adobo sauce. I cook my adobo with a little brown sugar to give it a syrupy consistency and a mild sweetener. Jut like Adobado, the BBQ sauce and adobo sauce gave it's Adobado identity. The sauce is just right, not salty, though not that sweet also. My kids said that the meat was so soft, you wouldn't bother using using a knife to it and it actually fell off the bones. It also had the radish and carrots salad. This is nice, I'm not sure if some household serve their Adobo with some salad, we do, I'd usually have it with cucumber salad, now I know it can also paired with radish. The Pancit Lucban wth Lechon Kawali. A bit pricey for a pancit, but it thus have ample serving of Lechon Kawali or others would call it Lechon Macau. I didn't think my kids will still eat some of this after having three samples from the FA. I love the Pancit Lucban, it is worth coming back for, perfect for a 'meryenda" for two. A bit sweet, and saucy, lots of nicely cooked vegetables, hot over a pad of banana leaf, giving it a more distinct touch, very "Lucban." The Lechon on the other hand has crunchy skin but too much fatty part, but equally delectable. The Beef Adobado was heavy enough, though my Danielle needed to order more rice. After that they both had Picole Italian Specialty Stick Ice cream. And they are full, it was then our turn to try the rest from Little Asia and PhoHoa. Do you think they were satisfied with all they've tried. No! Such monsters, they were still looking forward to going to Midnight Mercato and try out Johnny Steams, Steamed Savoury Burgers and some other stuffs there. Visiting any Banapple branch makes you feel like you’ve wandered into a fairy tale. The busy stretch of road becomes a woody forest, the honks and beeps of irritable drivers become birdsong, and the little restaurant in front of you is reminiscent of old Granny’s gingerbread house. There’s no witch waiting to shove you into the oven for dinner though; the ambience at Banapple is welcoming, comforting and, most of all, accepting. They do, however, have a tendency to overfeed you like dieting is the worst sin you could dare commit while alive. In Banapple you are encouraged to let it all go – all the stresses, the issues and problems of everyday life – and especially your diet. When asked, GJ and Maricel Jimenez describe their typical customer as being young and affable – a modern-day Hansel and Gretel. Equally young and affable they, GJ and Maricel are the proud owners of Banapple, a hard-working married couple with two children, who consider Banapple a labor of love. It is their simple and humble wish to provide Manileños with basic comfort food to brighten their days, to cheer them up, to allow them to pursue their tasks with smiles on their faces and good nourishment in their bellies. Perhaps this modesty and unassuming pride in what they do is what keeps them young in both appearance and heart. Or perhaps it’s being constantly surrounded by the smiling faces of satisfied customers and excellent food. A touch of home it is. 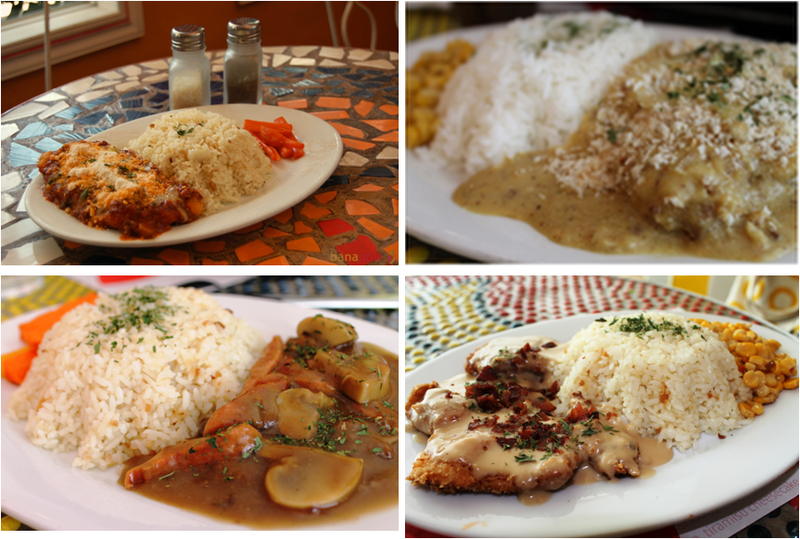 Banapple offers the most amazing savory dishes for the hungry humans out there. At first glance the meals are slightly more expensive than average canteen fare, costing around Php180 for a dish. Yet when the meal arrives does said hungry human realize that it could have been shared, so generous are the sizes. There is also Banapple’s coffee, roasted to perfection, an ideal complement to an amazing meal. 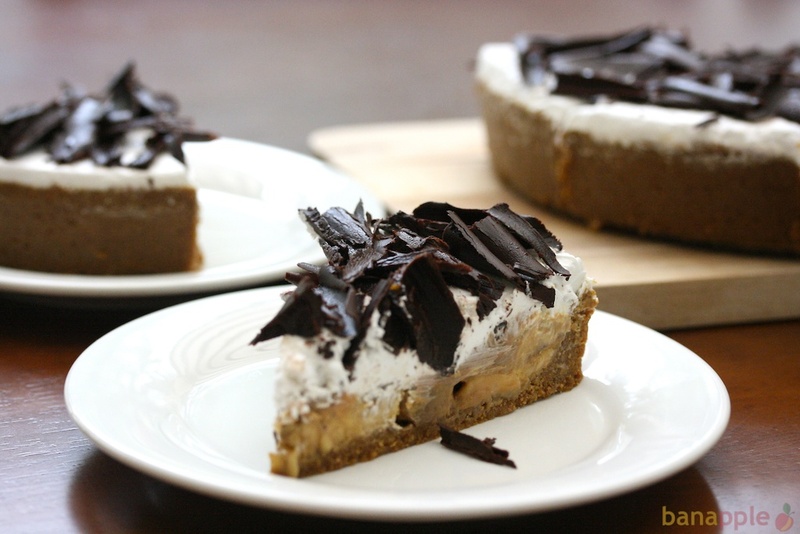 Any visit to Banapple wouldn’t be complete without sampling their amazing Banoffee Pie – or any of their other sweet tooth treats; the first bite is guaranteed to make you close your eyes and murmur in appreciation. With their food alone, you feel like you’ve entered a fairy tale as a member of the royal family, sitting down to banquet with the lords and ladies of the court, being waited upon by an attentive and cordial staff. No need to dress in your finery however; the ambience is so much like Granny’s house that it wouldn’t be surprising to see the three bears knock on the door, come to pick up some porridge on their way to the market. 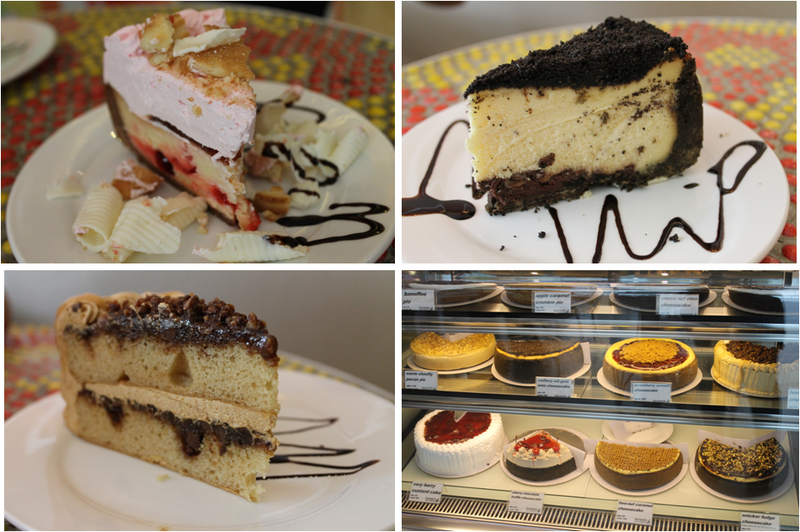 Banapple has been a loyal Quezon City citizen for the past three years, but thankfully Makati dwellers can experience the goodness of Banapple themselves soon enough. Considering that Banapple began in the kitchens of a home in Project 4, the restaurant has always held fast to its ideals of simple joys and pleasures – comfort food, a homey ambience, excellent service and smiling staff. 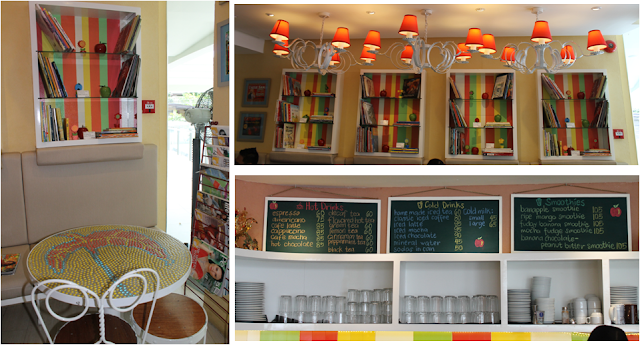 The restaurant reflects the homey vibe and family-centric values of Quezon City. They welcome all, young and old, and even had face painting activities last Halloween where they were proud to see twin toddler girls and a grandmother lining up to participate in the festivities. “We’d like to bring a little bit of QC coziness to Greenhills.” Perhaps that is exactly what Greenhills needs – a respite in the middle of the day, a quick jaunt to the Northeast Square on Connecticut Street for lunch, to satisfy your cravings for good home-cooked meals and ridiculously satisfying cakes and pies. And when you enter, you will be assailed first by how young you feel, so reminiscent is the restaurant of the fairy tales you heard as a child. So redolent is the food of yesteryear. You can imagine the many robust cooks and kindly grannies of many a fable creating such concoctions in their own kitchen havens. The smiling and accommodating staff, bedecked in their brightly-colored uniforms, are reminiscent of characters from a children’s cartoon. And should you be fortunate enough to encounter the charming owners yourself, you will realize the benefit of doing what you love to do and serving others with simple values and true humility – it is evidenced through a youthfulness, a kind and wholesome glow, a humble and simple affability, like the true hosts that they are. Banapple is the ultimate escape into a world that is somehow familiar, but not completely explored yet. Banapple smells like childhood. Who could resist a meal such as this. Irresistibly sinful indulgent! Lechon, seafoods, paella, croquettes and so much more. Ever wonder where I had this much all in one plating? 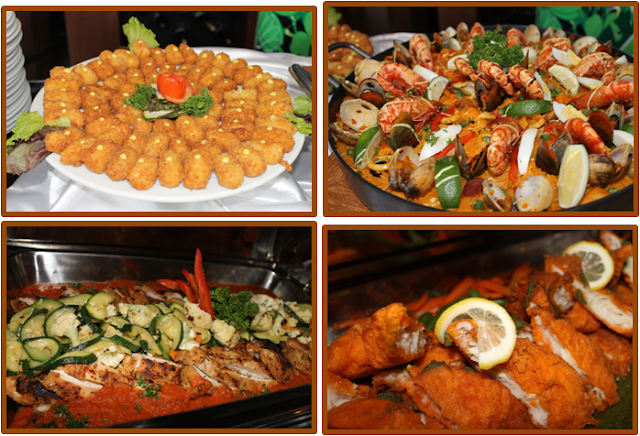 Acclaimed to be give the fine art of serving authentic Spanish cuisine! When you say risotto or pasta, that's Italian. When you say Sushi or Donburi, I bet you know it's from Japan. Risotto and Donburi consists mainly of rice, there is however an unclouded difference on the way the two dishes were cooked. Like Paella, a unique style was applied in preparing the three famous rice recipes. However, this is not a blog about rice and how it can be prepared. So when you say Paella, it is definitely Spanish! And when you say Dali Restaurante y Bar de Tapas, sounds Spanish, definitely Spanish. The style of the restaurant is "modern-baroque", with a white, elegant fountain welcoming you, while an al fresco mood invites diners to bask in fresh air and soft sun's rays. Inside is a massive dining floor, from the extravagant ceiling fixtures to the wooden dining furniture to the floors. Both the interior and the exterior of the place shouts Spain. Then came the buffet table. I have heard that the restaurant is said to be famed for their Tapas, again another glorious dish from Spanish culture, as can be found in their name, The Tapas Bar. Sad to say I was not able to try it, but we were able to sample some of the best dishes they offered in their menu. The picture above shows their Croquettas, so good with their garlic mayo dip. The classic Paella, humongous serving of shrimps, sea foods and chicken, pork and chorizo with a rich saffron infusion with long-grain rice. Below left, is the Polo clon Perijil y Pimientos, chicken fillet dressed in cucumbers, red bell pepper sauce (a tangy sweet combination from the vegetables). And the breaded fish fillet where in a beautiful pesto sauce smothers it, I'm such a sucker for basil and pesto sauces. Next on the roster are, Cochinillo, slices of roasted young pig, ever so soft to the bite and savoury. All heart-attacking dishes paired up with with rice topped with black beans, typically Spanish. And never to forget, my lovely Churros Con Chocolate. Do not ever leave the place without even trying the pastry puff with its thick dark chocolate condiment. The puff is not that sweet which compliments perfectly with the right chocolatey sweetness of the Spanish chocolate, the perfect dessert pair, should I say. Those are just a few on their menus. 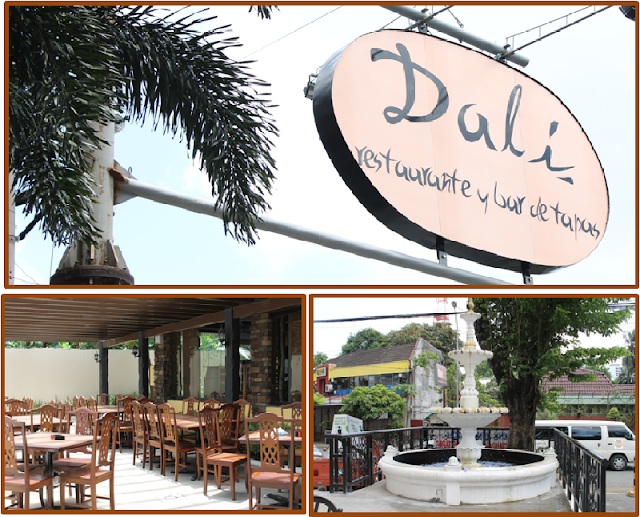 So if you are missing your lola's cooking or are in tune for fine notes of the festive Spanish cuisine, you can definitely find it here at Dali Restaurante y Bar de Tapas. Johnny Steams-Manila's First Steamed Burger! I got so crazy with grilled burgers. There is this particular hamburger chain from US which really captivated me from the first time it touched my taste buds. Oh, no why have I forgotten about it. Hey guys, I wish you could help me out here, they used to have a branch at Gorietta and Taft Avenue, near La Salle, now I could not find one here in Manila. And I couldn't even remember the name of the burger chain. I am a die hard fun of burgers. Let me choose between a rice meal and a burger meal, for lunch or dinner, guess what I'd choose, the burger. Let me tell you a short history of how I evolved into a carnivorous-eater. (hey, burgers have veggies). I had my first burger at Wendy's when I was 8, and I hated it then, because of the onions and mustard! Until Jollibee came, and oh how it became my first-love when it came to fast-food. Then I was introduced to McDonalds. When I was in college, BigMac was way to expensive for me, I needed to practically save some from my daily allowance for me to eat BigMac for at least a month. Time came that I could buy a BigMac for myself and had lost interest in it, cause of Jollibee's Champ. Then, went to dates with burgers as our staples, enjoyed while watching movies. Till Wendy's came with a bunch of chicken, BLT's, and more burger assortments. College life=Burger life! To make my life story short, I married, had babies and Jollibee....But then, the enlightenment, Carl's Junior. It was different, aside form the drink-all-you-can station, they introduced "char-broiled burgers" and they did not cut down on the greens and the tomatoes. During my kids growing period, we never missed a family day-out without making a stop at Jollibee, so what hubby would do is buy us a couple of burger meals at Carl's Jr. and ate it at Jollibee. Gone are the days, of my "burger-eating season", since more and more restaurants have been into fusion and themes that made dining fun an adventurous. A night at Mercato Centrale is a sinful indulgence. Diets are ruined, food discipline a No, No. But joy of eating a definitely Yes, Yes. Now I'm totally back into burger consumption. Thanks to Johnny Steams Steamed Burger. You heard me right, the burgers are steamed, not fried! No wonder, they are juicy, no hard and bitter part, every bite was a piece of pasteurific beefy goodness. We bought the burger and took it home, I decided to take a bite at the car, cause I was thinking the best time to taste it is while it was hot. I got Chili Cheese Burger, we were offered the Opa! Burger and Yankee burger, since I was quite undecided what to get, thinking it would be too spicy for me, for it has jalapeno chilies. Chili Cheese has all the works plus, the intriguing Johnny's home-made chili sauce, jalapenos and the 100% premium beef patty was greatly topped with the hot melted cheese, I think they used mozzerella on it. I would definitely go back for more of the Chili Cheese Burger and would definitely try the other flavors. By the way, we finished the whole burger without even reaching 1/10 of the way to our home... Really superb as what Bhogs would say! The light green creamy, silky and the play of cream cheese and pistachio captivated me. The cinnamon flavored crumb layer made the perfect match for the filling. I was actually looking out for different nuts, particularly walnut and pistachio, there was a stall nearby "Nuttyliscious," where they have it though they are not shelled yet and what a perfect nutty desert for my nutty craving. Samples from Pot hole, an extreme delight! A sudden change of atmosphere, thank God, there are coffee shops, diners and Coffenista! If you feel like cozying up with a special someone or with BFFs, this would definitely be the place. But I was blown away when Ms. Meryl had us tour the whole place and guess what, I think I found the place to recommend for any get-together. She also mentioned that they have been running the place since 2001. The place is relaxing, with ambient lights, crisp night music, glass-encased coffee beans table, cushy pillows on your back, and soothing aroma of the cofffee being brewed. Here is the perfect spot for singing to your heart's content, while lounging out with friends who smoke, and with of course filling your tummies with the house best grubs. They have what they call a Coffeeoke package. 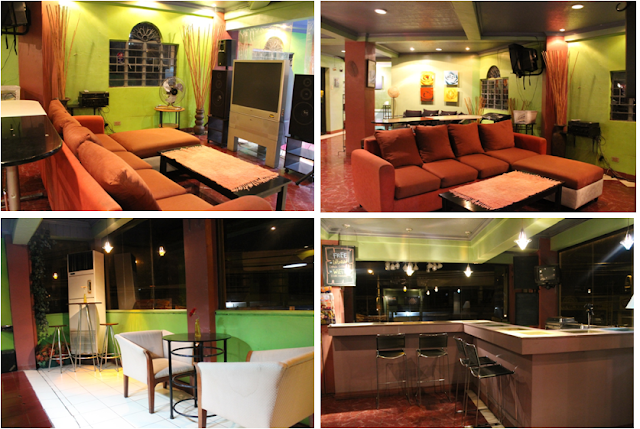 It is a place for videoke while feeling right at home and Ato's pulling off a coffee place environment. For bigger crowds, celebrate birthdays, reunions or ensemble one heck of a corporate event at the right wing of Ato's Rack. 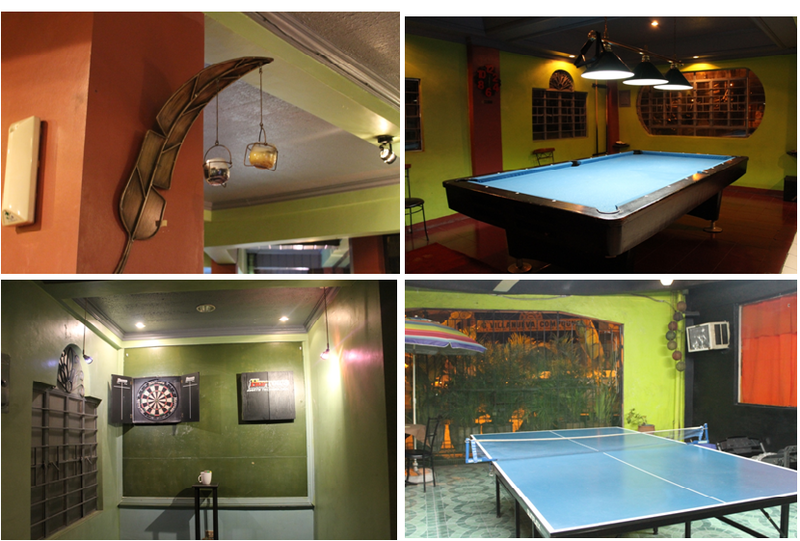 With amenities such as bar, pool tables, ping pong table, dart boards,internet and Coffeeoke. Here are some of the facilities you can also enjoy at Ato's Rack. Let me also inform you that they open at 5 pm everyday and closes at 2 am. 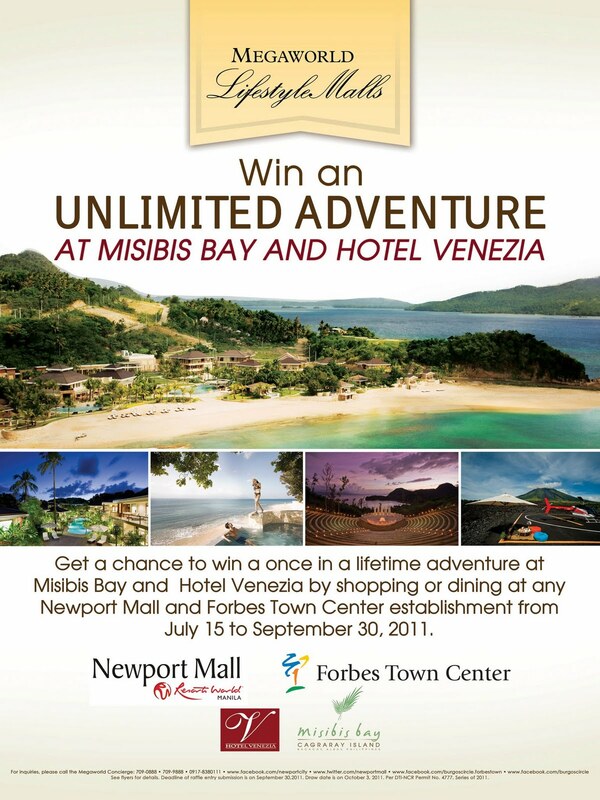 However if you may need to rent the venues, you may want to call Ms. Meryl-Ann Miranda. Ato's Rack named after her father, had been destinations for nightspots, not only for its menu but also for the amenities which "barkadas" will sure to enjoy. What was truly amazing is the plethora of their coffee concoctions, tea infusions, and forage that pairs with your drink. I got a bit conscious inside, after seeing lists upon lists of coffee concoctions, I was not able to decide what I'll be having, should it be hot or cold, bitter or sweet. Then I said "I'ts late nd I don't want to ruin my sleepiness when I get home, anyways Bhogs will be getting a cup so I'll sip some from him." So I got lavander -infused tea. The good thing here is that the sweetener, syrup, is separated so one has the option whether to have their teas sweet or just as it is. While Bhogs had Daddy Latte. Gosh I hope I got that right. True enough they always serve something extra, with his big mug, two cutesy choco chip cookies were served. So be sure to have surprises upon getting your orders, all for lesser cost. Yes the place is not cheap, it is actually chic, but the price ain't. Is that good news or what! And the highlight of the evening. The perfect MANGO CREPE I ever had in my life. And its huge too! The ultra thin pancake, simply delish, was as wide as a 12-inch in diameter plate, folded in half, and filled with big chunks of fresh mangoes and cream. A heavy scoop of dark chocolate ice cream and dullop of whipped cream, all drizzled with chocolate syrup. This is a dream, don't wake me up, please, please. So whether you're a LaSallista, an Atenista, or whatnot, you can definitely be a Coffeenista! Hey, I'm not a coffee connoisseur, but believe me, "coffee-nating" or "caffeinating" has never been this relevant and encouraging and never to forget comforting. What was funny was that I was not wedded with caffeine, what got me addicted was knowing the stories behind how each of these coffee artisanal thought of such possibilities and how they were able to deliver good service and of course good products. 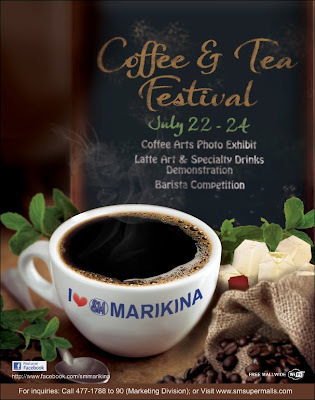 Join SM Marikina as they warm the hearts of every coffee lover as well as entice non-coffee drinkers to appreciate the different forms of coffee and tea, as well as the interesting culture behind it.Here are what to expect during the event and all is welcome, admission is free! Watch as they showcase this unique artform by Ms. Anj Ferreria, a Beverage and Coffee Advocate from Kaffe Caffe. Representatives from the Coffee Aid Foundation headed by Iona Arboleda-Santos will enlighten us with their advocacy. The best baristas in the country will showcase their special skills as they battle it out with the biggest coffee competition in the east. It's all here at the Hottest Venue in the East, I ♥ SM City Marikina. Win a once in a lifetime adventure at Misibis Bay and Hotel Venezia by shopping or dining at Newport City and Burgos Circle at Forbes Town Center between July 15 to September 30. Celebrating the world’s common need and love for food, Rustan’s Supermarket invites everyone to indulge in an international gastronomic experience and savor the unique and distinct culinary cultures of Italy, India, Spain and Germany from June to October 2011. Find cooking must-haves at our Ruchi! Indian Festival on July 22 to August 24. Rustan’s Supermarket offers a variety of spices and condiments, ingredients and fresh produce to help shoppers recreate some of India’s most popular dishes in the comforts of their home. 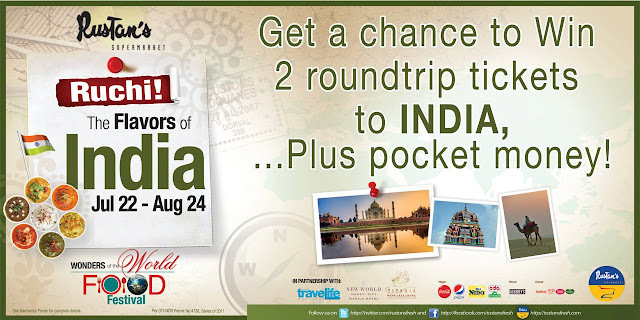 Now are you ready to shop and cook your way to India! Rustan’s Supermarket takes this gustatory journey to new heights via an actual world food trip. With the Around the World Raffle, 2 lucky winners will be picked every month to experience a trip of a lifetime (plus pocket money) to the four featured destinations. To encourage shoppers to continue with their food exploration, the supermarket is also giving away recipe books that feature each of the countries’ well-loved dishes for a minimum accumulated purchase from July to October 2011. Indeed, with an exciting sensory experience and veritable array of delicious, high quality products, Rustan’s Supermarket, together with its partners New World Hotel Makati, Travelife, and Titania, place a world of gustatory delights at your fingertips. Rustan’s Supermarkets are located in Glorietta-Makati; Rockwell Powerplant Mall; The Gateway Mall in Araneta Center along Katipunan Road, Quezon City; in San Antonio Plaza Arcade, Forbes Park, Makati; Greenbelt, Makati; Paseo de Magallanes, along South Superhighway; Corinthian Hills; Ayala Center, Cebu; Arcenas Estates, Banawa, Cebu, and Il Terrazzo Mall, Tomas Morato, Quezon City. "Nothing would be more tiresome than eating and drinking if God had not made them a pleasure as well as a necessity", words by Voltaire. True, realizing that the Lord promised blessing and bounty makes life worth living, and Him worth praising. But not all have free access to this information, what we need to understand also is that rewards have been set to those who wins. And how do we win? Easy! We only need to win His heart. I am not being charismatic here, this is practically the truth, what was real and essential in my life, in my marriage and in my family. I came to realize that there are people who drowns themselves with pleasure yet forget where it really came from. In the lows and highs of my life one thing stands true, that the Lord I came to know is true and alive in me. Yes you may not see Him, nor touch, nor taste, but I've felt Him and He remains in my heart and my thoughts. Today, food seems not only seen as a necessity but as an object of fanaticism. I've actually read in a certain PR material that there is such a thing as "food worship." This is now my prayer that anyone who reads my blog, also gain the full understanding that we are all loved and well taken cared of, if it may seem you are troubled and you find comfort in things such as food, dining and even fashion, don't be mislead. He is the ultimate source of everything! So go back to Jesus! This all came to me one night after a very full meal that my husband and I had at Corniche at the Diamond Hotel. No we aren't that rich, you might be saying, this people are throwing money on a dinner. As I was saying, it is not wrong to enjoy God's bounty, it is God's purpose for us to be happy and enjoy life at His blessing. 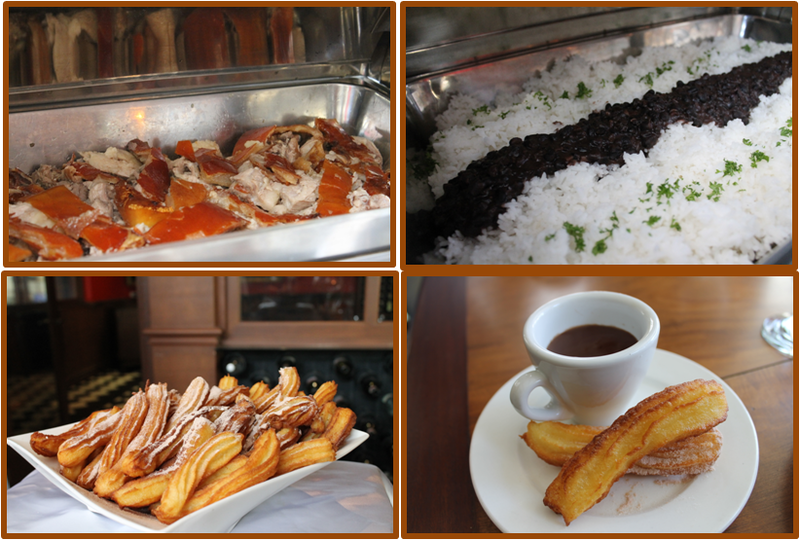 We had the buffet for P399, a load of discount from Ensogo deals. What made the dinner more delighting is sharing the blessing with the person you would want to spend an expensive and romantic dinner at the hotel or restaurant with. I pray the same for you and hope you find my pictures okay, no we didn't eat more than our tummies' could have but we tried to sample everything they offer to their clients. "Very few people possess true artistic ability. It is therefore both unseemly and unproductive to irritate the situation by making an effort. the feeling will pass. " The beauty of dessert! Kashi Makis of My Pink Wasabi, now on Mercato. My Pink Wasabi's Chocolate Fudge Cake, to die for! Another of my favorite at Mercato, Mochiko which was nearby, but we never had some that night, for Bhogs' eyes were on Mio Gelati, Italian ice cream, in new and exquisite flavors. It's 11 pm, by the time we were there, but still the place was jampacked, even kids were still out of bed and enjoying late night snacks with parents. One fabulous and uber-yummy find at MIO GELATI, I got Tiramisu and Bhogs had cookies and cream. Some of the previous stall owners who we had pleasures of eating with are still there. A certain stall got our interest, it was the first time we saw satays at Mercato. Chicken Satays' of Chef Rashid Rosete. Bringing Southeast Asian side-walk food, a level-up. Chef Rashid, a Muslim who studied in the United States, gladly talked to us about the "gourmet street food" known in Malaysia, Indonesia and Singapore, now making its way in Manila. I first encountered these belittled barbecue at Makan Makan. Satay , Chicken, mutton and beef, are grilled meat (Halal meats that is) smothered with sweet ans spicy peanut sauce. These prohibited foods and ingredients are called haram, meaning forbidden in Arabic. I don't know if you notice, Halal Certifications at certain foods labels, especially those that were produced and sold from countries were there are lots of Muslims. I hope this gives you a bit of understanding what Halal means, thanks to Chef Rashid for enlightening me on this. Let me tell you there are more than a hundred reason why should take at least one night out at the Mercato and once you do, you'll be wanting to go back for more! Hoping I could post the pictures I took from my first visit there, you'll be astonished of what foods you can find there and more!